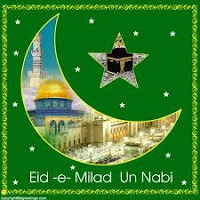 Eid-e-Milad-un-Nabi, the birthday of Prophet Muhammad was celebrated with great fervour and special prayers were offered in mosques and shrines on the ocassion across the country. President Pratibha Patil and Prime Minister Manmohan Singh wished people on the occasion of Milad-un-Nabi. "On the joyous occasion of Milad-un-Nabi, the birthday of Hazrat Mohammed Saheb, I express my greetings and good wishes to all my fellow citizens. May the message of service to humanity taught by the Holy Prophet lead all of us to unity and fellowship," Patil said in her message. The Prime Minister said Prophet Mohammed's teachings are timeless. "They will always inspire us to strive for the uplift of the poor and the downtrodden. May the festival of compassion spread peace, tolerance and brotherhood among all," Singh said. Snowfall and gloomy weather, failed to dampen the celebrations as devotees flocked to offer special prayers in praise of Prophet Muhammad in mosques and shrines in Srinagar Saturday night, officials said. The largest congregation was held at Hazratbal Shrine, which houses the Holy relic (a hair strand) of Prophet, on the banks of Dal Lake as thousands offered prayers, the officials said.